Sterling silver initial heart ring- perfect gift to symbolize love. Personalize a mother’s ring, couple’s ring or ring for daughter with the initials of loved ones. Sterling silver hand stamped ring. Adjustable band accented with two hearts. Categories: Best Sellers, Couples Jewelry, Hand Stamped Rings, Rings, Theme Rings-Adjustable Size. Please enter ‘no initial’ in each box if you do not want to personalize. 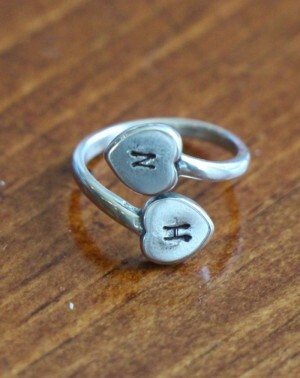 Tags: adjustable ring, hearts, initial heart, initial ring, sterling silver. *When resizing the ring, do not put pressure on the top of the ring. Gently, size the ring to your finger, so you can slip the ring on and off without reopening the ring at the top. This ring is a very nice option if you want a smaller ring size than a 6 as it can be squeezed together to be made smaller. It is a sweet ring and of excellent quality.I have purchased several pieces of K & S jewelry for myself and gifts and have never been disappointed!